No doubt the first films that come to mind when people think of Edgar Allan Poe adaptations are the AIP, Roger Corman Poe cycle of films, beginning with House of Usher in 1960, starring Vincent Price. However the first screen adaptations of Poe's tales began in the silent era and since then countless directors have attempted to bring Poe's dark imagination to life. Below is a compilation of some of the lesser known Poe adaptations, made for the screen during the 20th century. 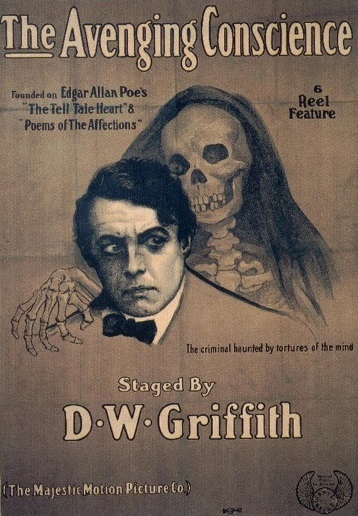 The Avenging Conscience is loosely based on The Tell-Tale Heart and Annabel Lee and was directed by D. W. Griffith. The story follows a young man's descent into murder and madness after his uncle thwarts his love affair with a beautiful young woman. This silent film marks the first screen adaptation of Poe's 1841 short story featuring the famous detective C. Auguste Dupin. Unfortunately the film has since been lost. A short, avant-garde interpretation of Poe's tale of a cursed pair of siblings, directed by James Sibley Watson and Melville Webber. A short Expressionistic film based on Poe's story of murder, guilt and madness, directed by Charles Klein. 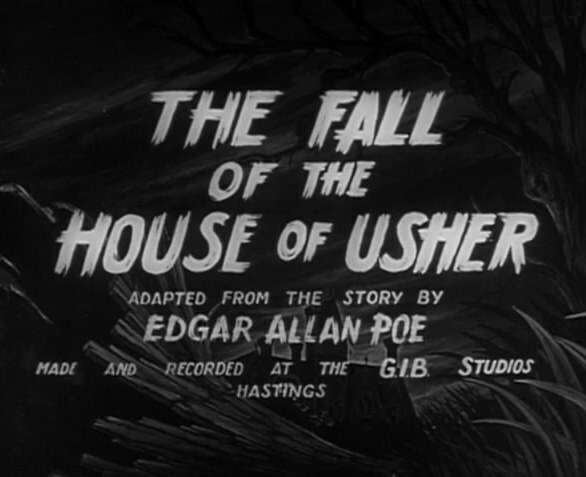 A French silent interpretation of The Fall of the House of Usher, directed by Jean Epstein. The above three films were influenced by both German Expressionism and French Impressionism. 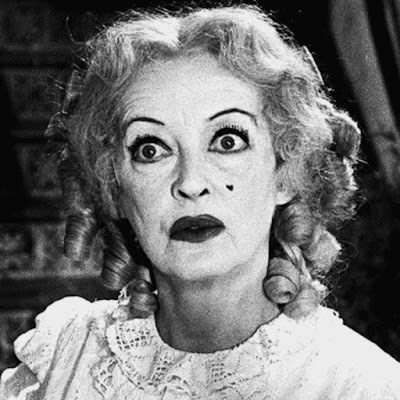 They use Expressionistic techniques such as dark shadows and sharp angles, seen in films like The Cabinet of Dr. Caligari (1920) and Nosferatu (1922). They also use Impressionistic editing techniques like dissolves, slow motion, superimpositions and double exposures, to create a disorienting and distorted point of view. In the 1930s and 1940s Universal Studios adapted several of Poe stories for the screen; usually starring Bela Lugosi and/or Boris Karloff, these films were considered part of the Universal Monster series. In Murders in the Rue Morgue Bela Lugosi plays a mad scientist who kidnaps women and injects them with blood from his pet ape. 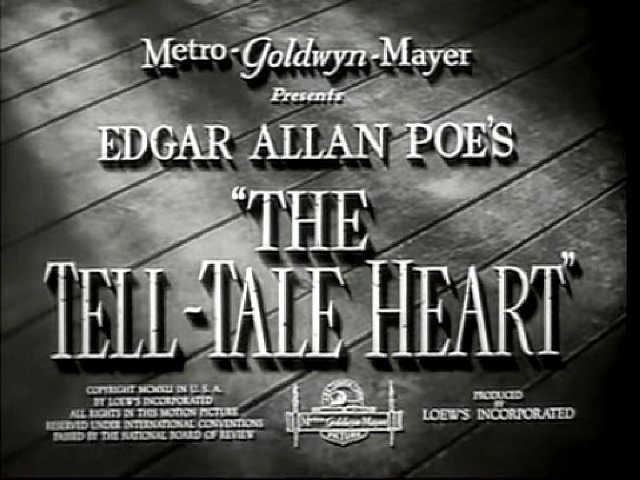 Full-length feature films had a difficulty in trying to expand Poe's short stories for 90 minutes, often taking liberties with the subject material and in some cases just borrowing the title. It would become a familiar device of studio marketing to use Poe's name to sell a film. The Haunted Palace (1963) directed by Roger Corman and starring Vincent Price, was really based on H.P. Lovecraft's The Case of Charles Dexter Ward. Likewise the 1968 Vincent Price film Witchfinder General was renamed The Conqueror Worm for the American market and Price's Cry of the Banshee (1970) was also attributed to Poe. 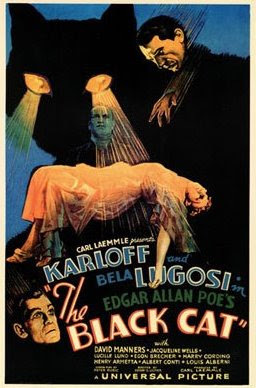 Although titled Edgar Allan Poe's The Black Cat, the film has very little to do with the Poe short story, except for the fact that one character has a morbid fear of cats. The film marks the first pairing of Bela Lugosi and Boris Karloff by Universal Studios. The plot follows the chilling and sadistic battle of wills between Dr Vitus Werdergast (Lugosi) and Hjalmar Poelzig (Karloff) and a young American couple who are caught in between. 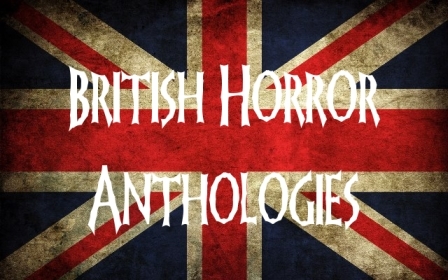 Although not a faithful retelling of the famous poem, it is evident that the filmmakers wished to evoke the atmosphere and themes of the poem as well as the entire Poe canon, with references to The Pit and the Pendulum, The Cask of Amontillado and The Tell-Tale Heart. In The Raven Bela Lugosi plays Dr. Vollin, a man who is thwarted in love and obsessed with Poe, collecting the torture devices depicted in his stories. Boris Karloff plays escaped criminal Edmond Bateman who begs Vollin for a new face, Vollin agrees on condition that Batemen assists him with his murderous revenge. The Crime of Dr. Crespi is very loosely based on Poe's The Premature Burial. Dr. Andre Crespi takes revenge on the man who married his lover, by injecting him with a serum that induces a catatonic state. 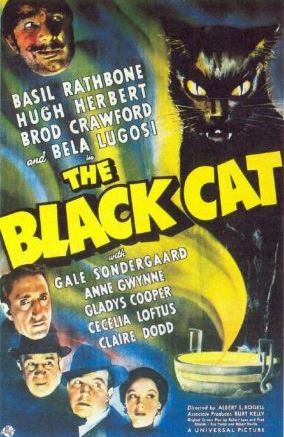 Another version of The Black Cat, again with Bela Lugosi in the cast, also starring Basil Rathbone, Gale Sondergaard and Alan Ladd. 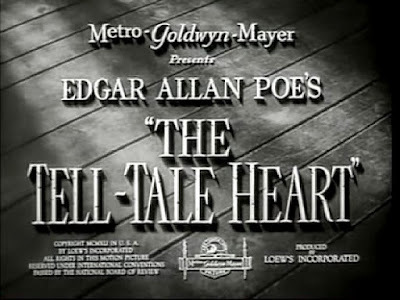 The film has even less to do with the original Poe short story than the earlier version, in the credits it says "Suggested by the story by Edgar Allan Poe.” The film has more in common with the mystery comedies of the period, like The Cat and the Canary (1939) and The Ghost Breakers (1940). The story features an elderly lady who gathers her family around her to inform them of the strange conditions of her will. The film does have the obligatory black cat stalking in the background and (with some plot connection to the original story) the black cat leads to the discovery of a hidden body. In the 30s and 40s many studios produced short films to show before their "A" features. 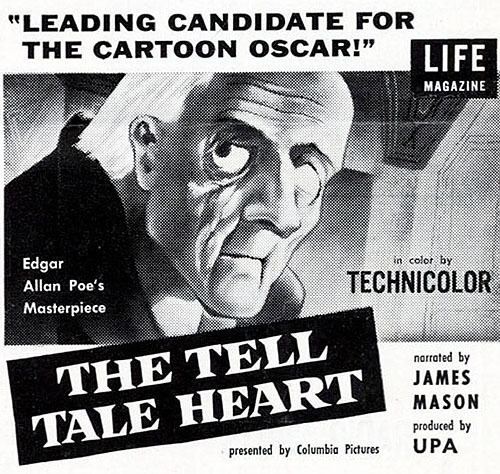 The Tell Tale Heart was part of the MGM Specials, a series of shorts based on literary classics. It was the directorial debut of Jules Dassin, who previously worked as an assistant to Alfred Hitchcock. He would go on to become the director of some of the great noirs of the 40s and 50s, including The Naked City (1947). In The Tell Tale Heart a young man (Academy Award winner Joseph Schildkraut) is subjected to the brutality of his master (Roman Bohnen) and decides to kill him. To mark a change from the original story the audience's sympathy lies firmly with the young man who you feel is somewhat justified in his crime. 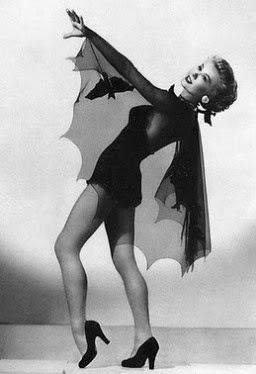 The Mystery of Marie Roget (also known as Phantom of Paris) is more faithful to the original source material than most of the Universal Poe adaptations; it was a B-movie often playing second bill to The Ghost of Frankenstein. The story is based on the real-life unsolved murder case of Mary Rogers, in Connecticut, 1841. The film stars Maria Montez as the title character, a popular Parisian entertainer who disappears, the police later finding a mutilated and unidentifiable body. It is left to detective C. Auguste Dupin (Patric Knowles) to solve the crime. 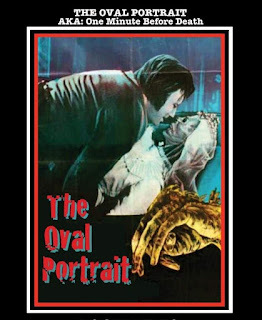 An obscure, low-budget British adaptation of Poe's tale. It deviates from the original story with the malady of the Usher siblings explained as the curse of their mother's lover, who was tortured and beheaded by their father. The acting is not brilliant but the cinematography is successfully eerie and atmospheric. This was an Oscar nominated animation directed by Ted Parmelee and narrated by James Mason. It was considered so disturbing that it became the first cartoon to be given an X rating by the British Board of Film Censors. It's use of surrealist imagery powerfully conveying the narrators descent into madness. Although it lost the Academy Award for Best Animated Short Film, losing out to the more wholesome Disney produced Toot, Whistle, Plunk and Boom, it has since been recognized as one of The 50 Greatest Cartoons. 1953 saw another adaptation of The Tell-Tale Heart. This obscure, hard to find British film starred Stanley Baker as Edgar Allan Poe, the only person listed in the cast. One suspects that the film, probably a short film, consisted of Baker narrating the story in front of a camera. 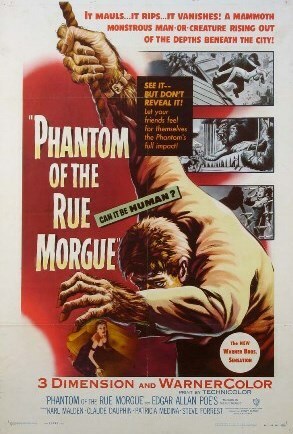 Another version of Murders in the Rue Morgue, starring Karl Malden, Claude Dauphin and Steve Forrest. This film marks the first Poe adaptation to be filmed in color and was one of Warner Brothers' earliest 3D movies, who were hoping to recreate their first big 3D success House of Wax (1953). Also known as One Minute Before Death, this low budget Mexican TV movie turns Poe's short story into a Gothic melodrama. A young woman becomes haunted by the portrait of her deceased cousin, who we learn fell in love with the artist, an escaped soldier during the American Civil War. Unfortunately for The Oval Portrait what could have been an interesting adaption and development of Poe's very short tale, is marred by its cheap production, bad dubbing, haphazard script and its awkward and somewhat embarrassing performances.